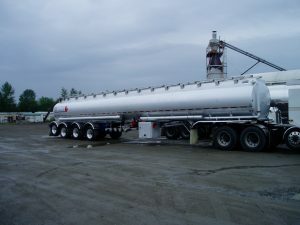 Ken Johnson Trucking Ltd. is a CTPAT-certified carrier with customers in western Canada and United States. 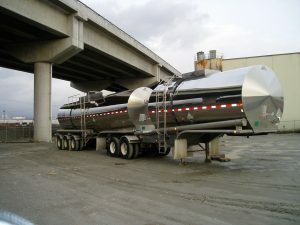 We provide bulk liquid transportation services for commodities including chemicals, lubricating oils, asphalt, dust palliatives, and special waste. Our fleet consists of 30 tractors and 65 trailers. Our trucks have the latest technology, ensuring our services are dependable and safe. Preventative maintenance of equipment is performed at regularly scheduled intervals in our own shop. All safety inspections are done at government-certified facilities. This includes semi-annual motor vehicle safety inspections of tractors and trailers, annual HM 183 tank inspections, and B620 inspections. Our wash bay facilities are built to protect the environment. They are government-approved and monitored regularly. They include tank cleaning systems for managing industrial chemicals.